Spend the 17th (Wed) exploring the fascinating underwater world at Sea World Theme Park. There's lots more to do: kick back and relax at Surfers Paradise Beach, stroll through Burleigh Heads Beach, enjoy breathtaking views from SkyPoint Observation Deck, and appreciate the history behind Queensland Korean War Memorial. To find ratings and more tourist information, go to the Gold Coast sightseeing planner. 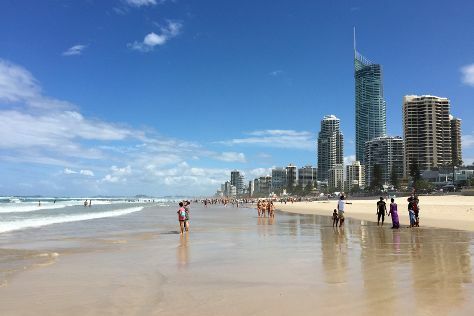 In April in Gold Coast, expect temperatures between 30°C during the day and 19°C at night. Finish up your sightseeing early on the 17th (Wed) so you can travel back home.